The best aquarium gravel for your tank depends on what lives there. Some substrates are suited to freshwater with fish or plants, and others are good for saltwater reef tanks. How much gravel will you need? Which gravel is best for freshwater fish? Which substrate is best for a freshwater aquarium with plants? What gravel is best for a saltwater marine and reef tank? Let’s take a look at the top choices for aquarium gravel first. Then we’ll present our guide to choosing the best substrate for your tank. The Carib Sea Peace River Gravel is good for freshwater or saltwater tanks with fish and plants. It’s pH neutral and all-natural. There are no dyes or coatings. And it comes with a packet of water conditioner, too. The size of the gravel is around 2mm, suitable for securing plants. It’s not hard to clean with a siphon vacuum. Plus, the color matches what’s seen in real-world waterways. Fluval’s Fancy Gravel is made of polished earth stones from India. This natural inert gravel has been tumbled until it has a smooth finish. As such, it’s safe for fish who like to burrow. And it’s kind to plant roots, too. The GloFish Gravel comes in a variety of bright and neutral colors to show off your GloFish. For example, you can buy it in white, black with fluorescent highlights, pink, green, blue, and so on. It serves as either a primary substrate or as an accent to other material. The GloFish Accent Gravel consists of larger marbled stones, colored pebbles, and brightly-colored gems. Combine it with the GloFish Aquarium Gravel for a stunning effect. Spectrastone’s Shallow Creek Regular comes as larger stones measuring anywhere from 5mm to 10mm in size. It’s coated to keep it from affecting the pH balance of the tank water. And it’s recommended for freshwater aquariums. Marina’s Decorative Gravel is available in a variety of colors, from blue and burgundy to neon yellow. Its coloring comes from an epoxy coating that keeps the gravel from affecting the water. But the epoxy creates a surface where beneficial bacteria can thrive. Customers report that there is little to no dust in the bag and that the stones are smooth. Carib Sea’s Eco Complete Substrate is a great choice for a freshwater planted aquarium. This particular version is black to imitate the volcanic soil of Costa Rica and Hawaii. It’s formulated to nourish aquatic plants without creating algae blooms. And no part of it is coated with anything artificial. Instead, this substrate is rich in iron, so you won’t need to add laterite. And it already contains heterotrophic bacteria to consume and convert fish waste. When the substrate arrives, you’ll see that the bag contains water as well. 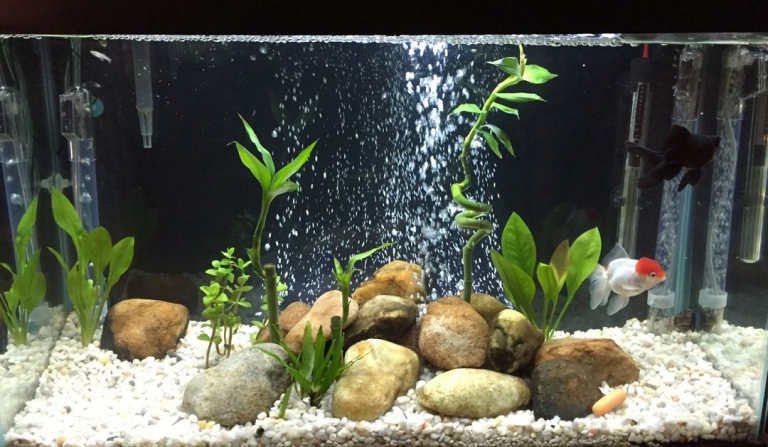 Users report that the gravel looks glossy and their fish love it. If you have a reef tank, you might enjoy Seachem’s Meridian Aragonite Substrate. It supports the growth of coral and is safe for tropical fish. Plus, it evens out the alkaline balance and calcium levels of the water. Seachem’s Gray Coast is another substrate for saltwater aquariums. It’s made from calcite to stabilize alkalinity without affecting the pH too fast. And it adds calcium to the water, too. Seachem’s Flourite is made of stable porous clay suitable for a freshwater planted aquarium. While it’s good enough by itself to support aquatic plant growth, it’s also amenable to mixing with other kinds of gravel. It comes in various colors like red and black. And it will last as long as your aquarium does without needing to be replaced. The Carib Sea Arag-Alive Reef Sand is specifically for saltwater aquariums with coral. It comes with millions of marine bacteria ready to filter the tank water. And it keeps pH steady, too. The Carib Sea Super Naturals Aquarium Sand is exactly what it says—all-natural sand. It’s available in different colors like Torpedo Beach and Tahitian Moon. And it doesn’t have dyes, paint, or a coating. Fluval’s Plant and Shrimp Stratum is lightweight and full of nutrients for aquatic plants. The porous material supports healthy roots and doesn’t crush or compact. If you raise shrimp, the Fluval Stratum’s texture provides places to hatch and hide. Plus, it gives bacteria a place to flourish. And it raises the acidity of the water slightly. Let’s begin with why it’s important to put a substrate in your aquarium. One reason is that gravel gives fish a non-reflective bottom surface just like they would have in the wild. That makes the tank more comfortable for them. A second reason is that eggs from fish or shrimp will have a safe place to hatch. Next, gravel and substrate provide a place for helpful bacteria to colonize. The bacteria act as a filtration system by turning ammonia and nitrites into nitrates. Nitrates are less toxic to fish and beneficial to aquatic plants. Generally, you’ll want the substrate to be at least 2 inches thick. That’s approximately two pounds of gravel per gallon of tank water. Factors like the shape of the tank, the texture of the substrate, and how much aquascaping you’ll be doing all affect how much you’ll need. Although you can use the rule of two pounds of gravel per gallon of water, the dimensions of the tank bottom are more important than how much it holds. In other words, you might have a deep tank that requires less gravel than the rule because it’s not very long nor wide. Play around with one of the online substrate calculators, and you’ll see what we mean. Be careful of building deep layers of fine gravel because it can trap leftover food. The food decomposes into hydrogen sulfite which is poisonous to fish. And plan on vacuuming the gravel once in a while to keep things tidy. Coarse or fine gravel made of quartz is a pleasant substrate for freshwater fish. Sand is also a nice choice if you have plecos or others that like to nose around on the bottom of the tank. Some aquarists recommend epoxy-coated gravel that hosts beneficial bacteria. But the bacteria also thrive in natural substrates, too. And the fewer coatings and dyes or paint on the rock, the better. Plan on building two layers of substrate for a planted tank. First, lay down a 2-inch thick bottom level with nutrients. Then put down another two inches of ordinary aquarium gravel to anchor the roots. Try laterite, which is a hardened clay, at the bottom of the aquarium. It stores nutrients for the plants. You can mix it with vermiculate that is a mixture of minerals that won’t affect the pH of the water. Saltwater marine aquariums require more calcium and magnesium, so aragonite is a good substrate for them. It’s calcium carbonate that slowly turns the water more alkaline. And the calcium is important for coral growth, too. You can make a case for gravel or sand in a freshwater aquarium. There are pros and cons to both kinds of substrate. Sand is pleasant for a number of reasons. Many aquarists prefer its natural appearance. And fish that like to burrow love it. Some species of cichlids consume sand to help them digest. Plus, it’s closely packed, so it needs less cleaning and leftover food and debris tend to remain on top. But sand can kill goldfish because it can block their intestines. And if sand enters your filtration system, it can cause clogs. On the other hand, gravel is a smart choice for most freshwater tanks whether they have plants or not. Because it’s not compacted like sand it allows water to circulate through it. Good water flow keeps toxins and amoebas from becoming a problem. Plus, gravel is unlikely to be sucked into your filter. And it’s possible to buy gravel in a wide assortment of colors. You don’t need expensive equipment to clean the gravel in your tank. All you need is a siphon vacuum which consists of plastic tubing, and a clean bucket. Begin by turning off the filter, the heater, and any pumps or other devices. Put the thin end of the tub inside the bucket, and place the bucket lower than the tank. Then insert the thick end of the vacuum tube into the water slowly. You might need to prime the vacuum to start the water flowing. Once the water is flowing into the bucket, move the vacuum around in the gravel. If the gravel starts to rise up into the vacuum too far, cover the thin end of the tube with your thumb to halt the flow. The gravel will settle down, and you can continue to work by releasing the end of the tube. If you have fish living in the tank, don’t drop the water level more than 30% at a time. This means you may not finish vacuuming all the gravel at once. And that’s perfectly fine because it leaves plenty of beneficial bacteria to protect your fish. There are many different kinds of aquarium substrate you can use depending on the type of water and what’s living in the tank. The best aquarium gravel is the one that matches the needs of your setup. And chances are you’ll find it in any color you desire.